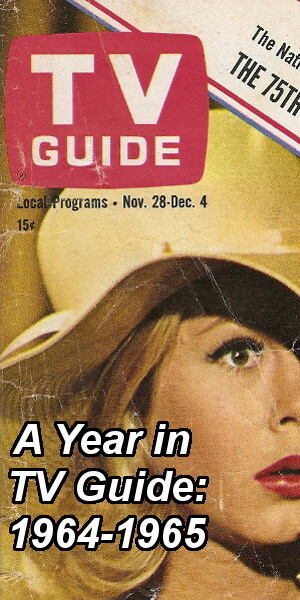 A Year in TV Guide explores the 1964-1965 television season through the pages of TV Guide magazine. 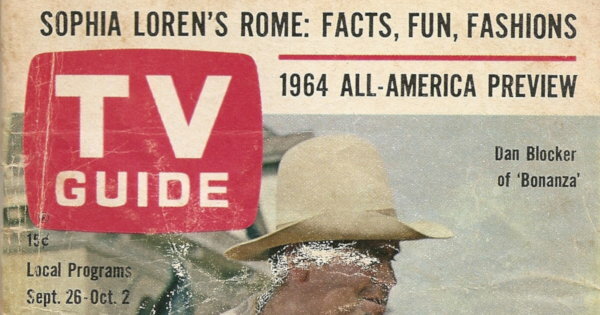 Each week, I’ll examine the issue of TV Guide published exactly 50 years earlier. The intent is not simply to examine what was on television each week but rather what was being written about television. On the Cover: Dan Blocker of NBC’s Bonanza (photograph by Carl Frith). You might think that this issue would have included at least one article about the new TV season that got underway in September 1964. Perhaps an article highlighting a particular new show or speculating about ratings and the odds of survival for the new fall fare. There was nothing that in this issue. There was a preview of the 1964 football season and a look at Sophia Loren’s November ABC special, which perhaps goes to show where TV Guide‘s priorities lay. As I mentioned last week, the 1964-1965 season officially kicked off on Monday, September 14th but the first two-week Nielsen NTI report didn’t come out until mid-October. 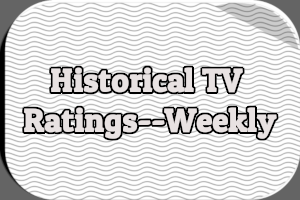 There were early ratings reports available — overnight New York City Nielsens and 26-city Trendex ratings — but everything revolved around the national Nielsen reports. TV shows lived or died on the national Nielsen reports. As far as I can tell, TV Guide only discussed the national Nielsen reports. Still, I’m a little surprised there wasn’t some discussion of the new season. The listings in this issue (Saturday, September 26th through Friday, October 2nd) covered most of the third week of the season. Front Cover – Copyright 1964 Triangle Publications, Inc.
My copy of this issue is in pretty poor shape. The cover is severely creased and almost worn through in several places and barely attached to the spine. It definitely got used. The coupon worth 10 cents towards the purchase of a half gallon of Hood Coffee Toffee crunch ice cream was not used, however. The only reason the 1960 Nixon-Kennedy debates were possible is because Congress suspended Section 315, which was not repeated in 1964. TV Guide hoped that if Congress acted after the 1964 election, perhaps future debates might be possible. (They would, but not until 1976). Allan Scott has written an episode of Ben Casey called “A Thousand Words Are Mute” about a woman recovering from a stroke, based on his wife’s experience. It will feature his daughter, actress Pippa Scott. ABC’s overhaul of its daytime schedule will go into effect October 4th. The Tennessee Ernie Ford Show (12:30-1PM) will change its name to Hello, Pea-Pickers as well its format. A new soap opera, The Young Marrieds (3:30-4PM), will premiere. It is about three young couples in love and is set in the same city as General Hospital so crossovers are possible. David McCallum is the unofficial technical adviser for all things weapons on The Man from U.N.C.L.E., having spent two years as a small-arms expert in the British Army. Included in this issue are five articles and a picture feature in which Jim Nabors has his hair cut Marine-style in front of the cameras for Gomer Pyle, U.S.M.C. There’s a picture of Nabors looking very sad about losing all his hair. I admit to not reading much of “College Football Calls on the Specialists,” a three-page look at how the 1964 TV Guide All-American team will be chosen. The team will be published in the November 28th issue, so I have that to look forward to. Honestly, I don’t know anything about football other than the very basics of the sport and definitely don’t know anything about 1964 football. I made it about two paragraphs into this article before giving up. But it does prove that football has been popular on television for more than half a century, even if there are some viewers who just don’t get it. “She Hopes the Prescription Works” is a four-page article about actress Stella Stevens, who hoped her five-episode arc on ABC’s Ben Casey will make her a Big Star. It apparently didn’t work. “Sophia Loren in Rome” is little more than a puff piece for the upcoming ABC special of the same name masquerading as a behind the scenes look at the production of the special in Italy. We learn that Loren loves to gamble and prefers to speak American English rather than British English. There are five pictures of her, all featuring different outfits. “The Day the Irish Turned Orange” is an interesting two-page look back at the history of color television, with some fun tales about the problems facing color technicians in the 1950s. Red Skelton played a practical joke one night by putting on green makeup, worrying technicians and viewers alike. Colored polka dots were painted on 20 elephants during filming of the pilot episodes for The Greatest Show on Earth, because they were too grey and boring otherwise. The fifth and final article, “There’s No Place to Hide,” is three-and-a-half pages about Dan Blocker, who also graced the cover of the issue. It mostly discusses his problems with fame and publicity. He couldn’t go to a baseball game without being mobbed by kids looking for autographs, for example. He didn’t like losing his privacy. He was so upset about it that in 1961 he apparently tried to go back to teaching. From the perspective of a researcher, none of these articles are particularly useful. Most of them are more promotional than factual. I imagine readers in 1964 found them more interesting than I do 50 years later. Republican National Chairman Dean Burch filed a protest with the Fair Campaign Practices Committee regarding the famous “Daisy” political ad for President Lyndon B. Johnson. “This horror-type commercial is designed to arouse basic emotions and has no place in this campaign,” he said. The Democratic National Committee said it wasn’t sure whether the ad would be aired again. Samuel Goldwyn has forced British theater owners to allow American movies on British TV, by ignoring their threat of a ban and licensing movies anyway. The Hartford Pay-TV experiment is a success. According to Zenith/RKO-General, there are 5,000 subscribers paying $100 a year to watch movies and boxing matches as well as a backlog of applications for new subscribers. The Letters page, also in the listings section, features five letters about the 1964 Miss America contest. One criticizes Miss Arizona for somehow managing to “plug a political candidate in her ventriloquism act.” Other letters discuss Jerry Lewis announcing his new children’s show on Pay-TV; NBC’s NCA football games in color; and the lack of reviews by Cleveland Amory lately (according to a note, Amory’s first review of the new season will appear in the October 10th issue). 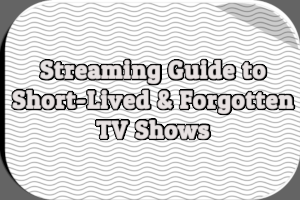 In addition to ads for more new and returning network shows, this issue also has some ads for local stations and programs. New shows premiering during the week included Mr. Broadway, My Living Doll, Gilligan’s Island, and Shenanigans. Returning for the new season are shows like Jackie Gleason’s American Scene Magazine, Mr. Ed, What’s My Line?, and That Was the Week That Was. Chevrolet has a full page ad promoting Bonanza, The Man from U.N.C.L.E., and Bewitched. Both Bonanza and The Man from U.N.C.L.E. ran without commercial interruption this week, followed by a special five-and-a-half minute commercial for Chevrolet’s new 1965 models. Filmed on the Bonanza set, the commercial features the casts of all three shows in costume and in color. Chevrolet Ad – Copyright 1964 Triangle Publications, Inc. There were at least fourteen sporting events on Saturday alone, ranging from water skiing and roller derby to tennis, horse racing and a snake hunt. Sunday has more sports, mostly baseball and football. And on Monday there’s an Olympic preview in prime time on NBC. Many of the movies this week were also available the previous week, suggesting that Phonevision didn’t have a huge catalog. I doubt many subscribers were paying to see the same movie week after week. It was much easier to pick out local programming in this issue than the Fall Preview issue last week. There are some local ads mixed in with all the network ads. Many of them are for local movies, including one promoting WWLP (Channel 22), the NBC affiliate in Springfield, MA that showed a feature movie at 4:30 Monday through Friday with a different them each day of the week. There’s also an ad for Connecticut’s CBS affiliate WTIC-TV (Channel 3) and its after dinner movie on Monday at 7:10PM. This week it was A Prize of Gold (1955) with Richard Widmark. 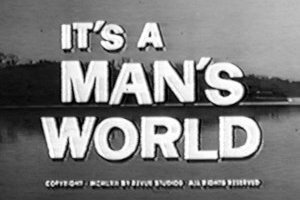 WTIC-TV Ad – Copyright 1964 Triangle Publications, Inc.
WHDH-TV (Channel 5), the CBS affiliate in Boston, was able to originate color programs at its studio. Weeknights from 6:-6:25PM the station aired a color program called Dateline Boston, followed by a five minute weather report, also in color. The station also had color news breaks throughout the day. Other local programs of note: WWLP’s Top 22 Plus One Studio Dance Party, weekdays from 6-6:15PM; Starring the Editors, with newspaper editors from Massachusetts and Connecticut, Saturday at 7PM on WHNB-TV (Channel 30); “Connecticut Nurses,” a special on WHNB-TV commemorating the 60th anniversary of the Connecticut Nurses Association, Sunday at 6:30PM; and something called “Connecticut – What’s Ahead?” on WTIC-TV Wednesday at 8PM. That’s it for this week. Hit the comments with your thoughts. Awesome read, thank you for sharing. Just one question out of curiosity. Was TV Guide owned independent of the networks or did it have ties with any of the major broadcasters? Back in those days Australia had 2 national TV magazines, one (TV Times) owned by the government-owned broadcaster ABC (probably similar to Radio Times and BBC in the UK) and the other (TV Week) had ties to one of the commercial stations. Each publication appeared to remain broadly objective in reporting all networks but some subtle favourtism could be detected. TV Guide has always been an independent publication. That doesn’t mean it doesn’t have close relationships with the networks. After all, it needs the network publicity machines to provide it with access to stars and press material. Didn’t Dan Blocker die a year or so after this article was published? Dan Blocker died in May of 1972, eight years after this issue. This is fantastic! I look forward to following this all season. 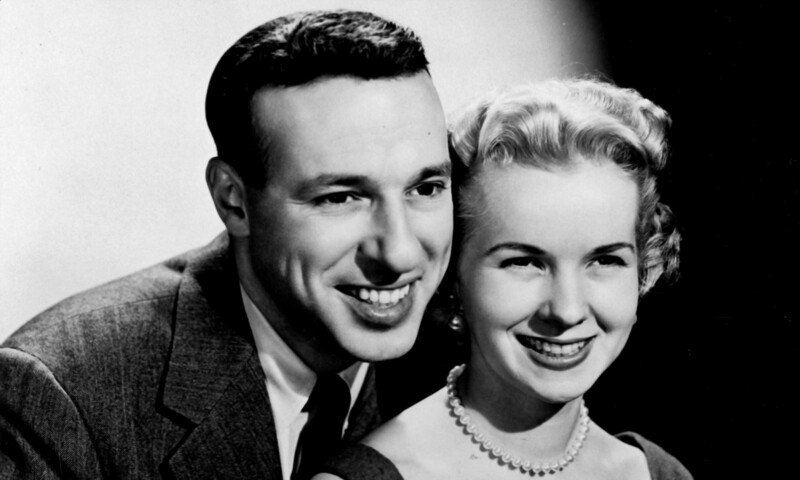 The Monday movie on WTIC…it aired that from the time it became a CBS affiliate in 1957, until 1975–preempting top rated networks shows.the Eye was running in the time slot. Fifty years after THE MAN FROM U.N.C.L.E., David McCallum is acting in pretty much the same capacity for his current role as “Ducky,” the medical examiner on CBS’ NCIS. I read a piece years ago that talked about McCallum studying forensic science to prepare for the role and apparently becoming so adept at it that he became the show’s ersatz technical adviser. Again, another great write-up. Interesting note about Dean Burch complaining about the “Daisy” commercial – he would go on to serve as chairman of the FCC during the Nixon administration. Any thoughts on where I might find WBZ Boston series “Starring the Editors”? 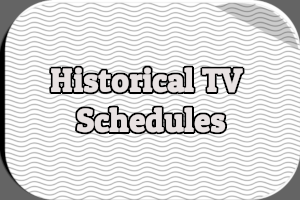 I am researching TV Guide Photography from 1953 to 1964. My focus is on the photographers. If anyone has information on this subject I would appreciate a contact. Thank you!